Across Canada, incidents of workplace violence against health care workers happen daily. From verbal abuse to aggravated assault and sexual violence, rates are spiking in all health care settings from hospitals, emergency response, and home and long-term care. Studies show those most at risk are nurses and personal support workers who have the most direct contact with patients and their families. Indeed, all the Ontario registered practical nurses and personal support workers in attendance at a CUPE health care conference specifically focused on violence, said they have experienced workplace violence. Hospital emergency departments and psychiatric wards are the most violent, according to research. It is also widely understood workplace violence against health care staff is under-reported largely because of fear of employer reprisals against workers who report. In Ontario, where provincial spending on hospitals is the lowest among Canadian provinces and there is insufficient front line staff to provide adequate patient care, hospital and long-term care workers have made curbing rising rates of workplace violence a priority. 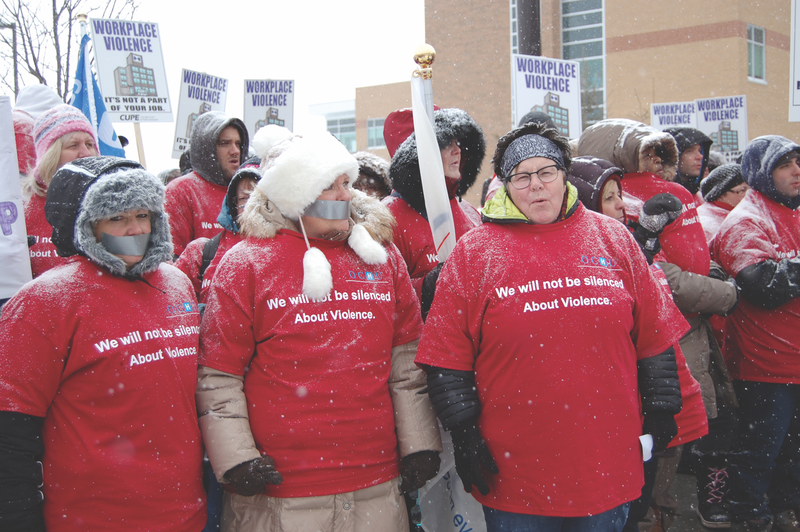 Following the firing in the winter of 2016 of a registered practical nurse who spoke on a panel at the 2016 health sector violence conference, health care workers are saying “enough is enough”. Hospital, long-term care and home care workers – about 75,000 CUPE members in Ontario - have the right to be safe at work. They’ve developed a plan to get the provincial government to listen to them and strengthen protections. One protection they are seeking is for a specific category under the criminal code to make violence against health care workers an offense. Through focus groups with health care staff who had experienced violence both directly as a target or as a witness to violence against a co-worker, CUPE’s Ontario Council of Hospital Unions working with independent researchers are telling “first-person” accounts of workplace violence through both a video and soon-to-be published report. Ontario-wide media conferences are planned throughout 2017, which “give voice to the many health care workers who have been assaulted at work and challenge directly the culture of reprisal and attempts to silence workers who speak out against workplace violence,” says Michael Hurley, president of CUPE’s Ontario Council of Hospital Unions.